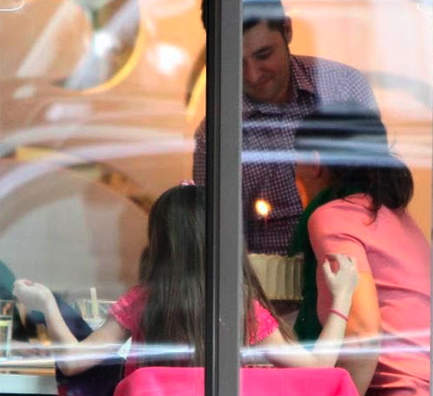 Suri and Katie went out to Shake Shack in NYC on January 30th 2013. Suri was wearing Embroidered Dress FW'12 by Crewcuts. 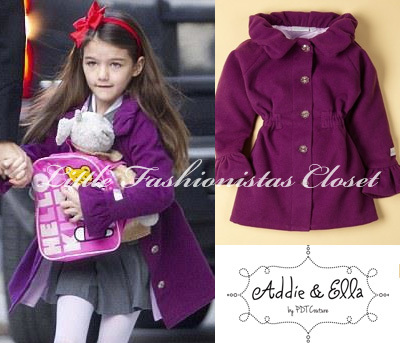 Suri was wearing Plum Purple Coat FW'12 by Addie and Ella, while walking to school on January 3rd 2013. Thanks to Mai-Lis from Addie & Ella for the info! Suri & Katie attended a friend's birthday party at Locanda Verde restaurant in Greenwich, NYC on January 27th 2013. 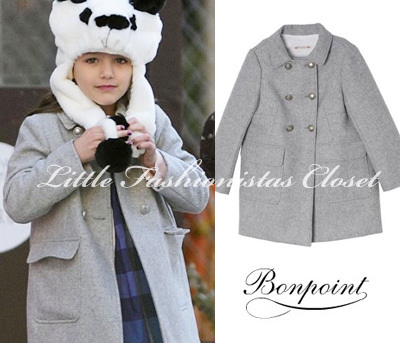 Suri was wearing Maple Coat in Lt Grey FW'12 by Bonpoint, Voile Checked Dress in Iris Blue SS'13 by Burberry. Suri was also wearing Black Leather Riding Boots FW'12 by Gucci Kids. later on, S&K got their nails done together! Suri & Katie were spotted shopping in NYC on January 26th 2013.
outfit info: pants by crewcuts, ugg boots. 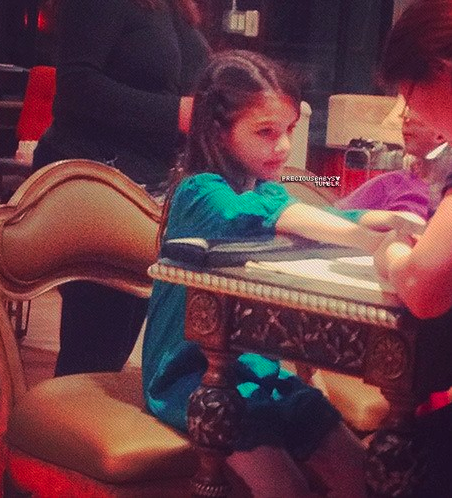 Suri was pictured getting her nails done in NYC on January 10th 2012.
and later Suri & Katie had lunch at Sarabeth's Kitchen. 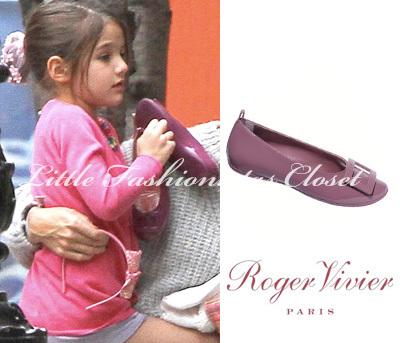 Suri was wearing Natasha Glitter Ballerina Shoes by Sparkle Club (UK). Thanks to Harmony for the id! 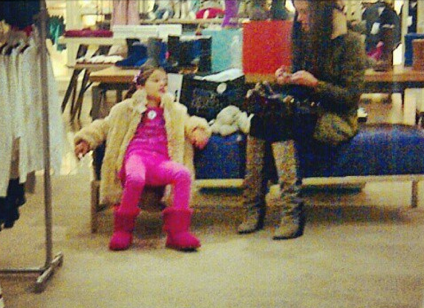 Suri was keeping warm by wearing Lime Faux Fur Jacket from All For Children UNICEF collection by H&M. Suri & Katie went to see a ballet performance at the Lincoln Center in NYC on January 20th 2013.
outfit: 3/4 Sleeve Fleece Coat in Pink by Barney's NY (first worn in August 2012), Gommette Purple Patent Ballerinas from FW'12 Jeune Fille by Roger Vivier (first seen on September 30th 2012) and Matilda Dress in Amethyst FW'12 by Little Ella Moss (first worn on November 3rd 2012). Suri & Katie and enjoyed a day at the NYC park and walked along the Hudson River on January 9th 2013.
outfit info: scarf babycz, all by crewcuts. Suri & Katie pictured taking a stroll in NYC on January 6th 2013.
outfit info: puffer, jeans by crewcuts, scarf by baby cz. Suri & Katie went shopping to Crewcuts and H&M at Time Warner Center in NYC on January 2013. 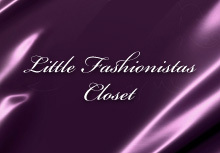 Suri left holding Purple Glitter Skinny Belt by Crewcuts. Suri pictured walking to her Avenues School in NYC on January 3rd 2012. Suri has a new Pink Hello Kitty Backpack by Sanrio, and a smaller one for her fav Little Giraffe toy! cute!!! Suri was wearing Plum Purple Coat FW'12 by Addie and Ella. outfit info: shoes by ralph lauren, cardigan by gap. 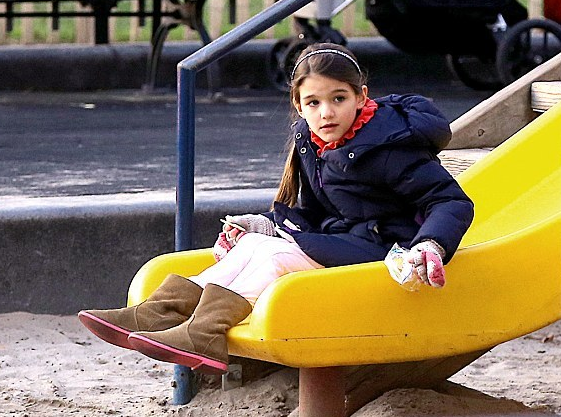 Suri is back in NYC and was spotted arriving to MusicBox Theater with Katie on January 2nd 2012. Suri was wearing Fuchsia Dyed Skinny Jeans by J Brand for Crewcuts. 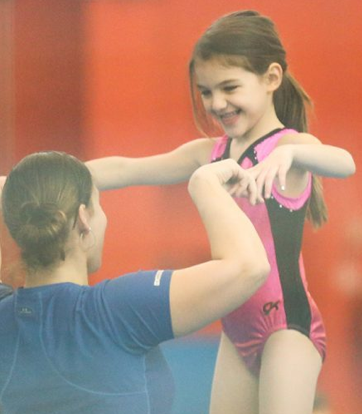 Suri & Katie spent Christmas together with Katie's family in her hometown - Toledo, Ohio. On the next day Suri joined Tom, Conor & Isabella at his mountain getaway in Telluride, Colorado. Suri & Katie stocked up on greeting cards and stationery at Papyrus store in NYC on December 23rd 2012. 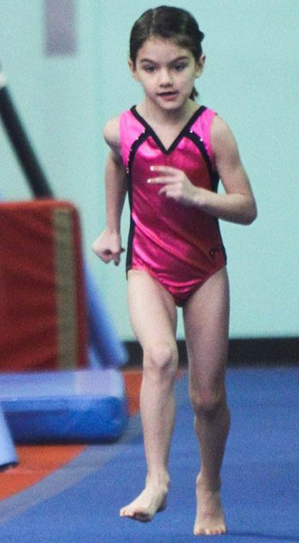 Suri was wearing an all-pink outfit accessorized with Pink Peace Sign Scarf by Old Navy and Hot Pink Bow UGG Boots. outfit info: Pink Puffer Coat FW'12 by Monnalisa (first seen on October 21st 2012) and Pink Betsy Bow Dress FW'12 by Milly Minis. 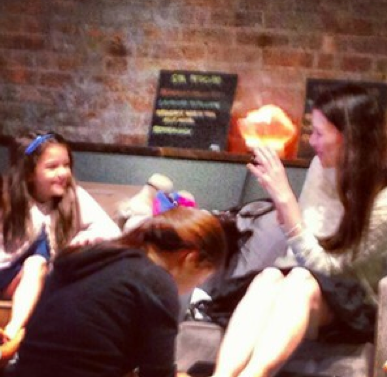 Suri & friends celebrate Katie's BirthDay at Sugar and Plumm in NYC on December 18th 2012. Suri was wearing Princess Pink Hooded Cover Up by Disney Store. outfit info: 3/4 Sleeve Fleece Coat in Pink (first worn in August 2012) by Barney's NY and Flower Violet Ballet Flats by Bloch. 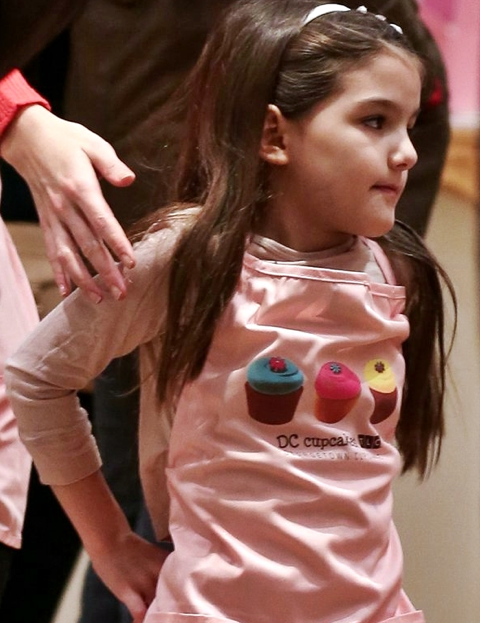 Suri & her friends made some cupcakes at Georgetown Cupcake store in NYC on December 17th 2012. Suri was wearing Navy Powder Puffer and Pink Silk Bubble Skirt, both FW'11 by Crewcuts. outfit info: Fiona Tshirt FW'11 by Stella McCartney Kids. Suri & her BFF attended Katie's performance at MusicBox Theatre in NYC on December 15th 2012.
outfit info: Pink Puffer Coat FW'12 by Monnalisa (first seen on October 21st 2012) and Green Velveteen Shoes FW'12 by Il Gufo.